When the University of Virginia men’s basketball teams takes the floor for a game, there are actually two teams at work. One is the team of student-athletes on the floor, of course. The other is seated alongside the floor, either on the team bench or behind it – the team of staff members who support the student-athletes, from coaches to strength coaches to sports medicine practitioners to academic advisers and even student managers. T.J. Grams is one of those guys in suits seated behind the bench, at home or away. 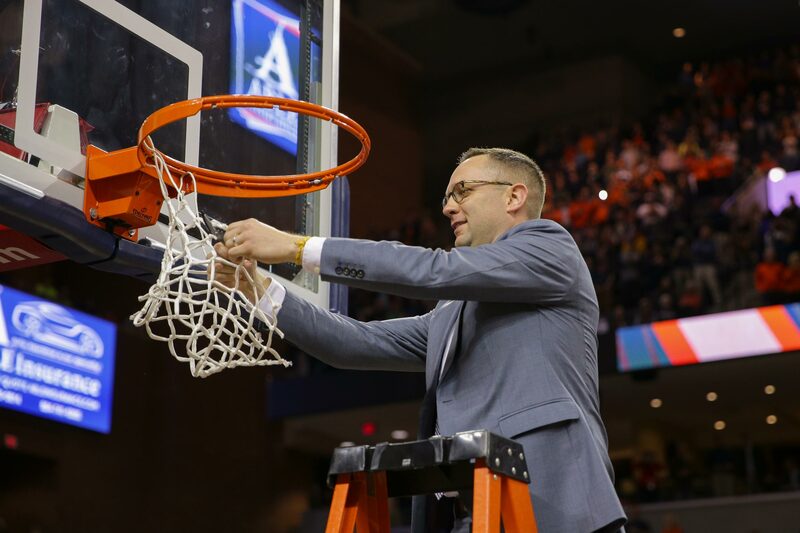 His official title is director of academics for men’s basketball, and his role is every bit as valued as those of his teammates. He attends team practices and is closely involved in the planning that goes into managing the schedule of a Division I basketball program. “Coach Bennett has prioritized integrating me into his support staff,” said Grams, who, appropriately, is the son of a coach and a teacher. “My involvement with the team doesn’t end at the end of the academic day. … The pillars of our program are real, tangible values to our staff, and I try to live them out by serving in any capacity that is needed. That could look very differently at 9 a.m. during study hall, compared to 9 p.m. on a game day. Grams came to UVA after five years in academic support of student-athletes at Duke University, and previously worked as an academic adviser at the University of Notre Dame’s Mendoza College of Business. He was a graduate assistant academic coordinator at North Carolina State University while earning a master’s degree in higher education there, finishing in 2003. “Having the experience of working in various areas across the university landscape has definitely helped in my current role, because I can speak a common language and understand how the student-athlete experience fits into the operations of other areas of the University,” he said. At UVA, Grams is pursuing his doctorate in higher education at the Curry School of Education and Human Development, performing his own balancing act between athletics and academics. Grams, who also works with the men’s golf team, found time to answer a few questions by e-mail this week before boarding the team flight to Minneapolis for this weekend’s Final Four. Q. There must be a lot of groundwork that is laid well before you hit a frenzy like a Final Four trip, right? What is your role in working with student-athletes, coaches and professors? When does all of that start? A. Very little has changed from our routine since the NCAA Tournament began after spring break. We try to create consistency throughout the academic year and rely on those habits when the travel portion of the season intensifies. The groundwork begins in the first week of summer school, where we start building habits of accountability, reliability, time management and self-advocacy. I do work closely with all three groups of people that you mentioned, but in very different ways. My communication with the coaches happens daily. Coach Bennett has prioritized incorporating my role into his support staff, which helps our students recognize how much he values their academic experience. I work most closely with Associate Athletic Director for Men’s Basketball Ronnie Wideman to integrate the academic responsibilities into the basketball schedule, and vice versa. My work with the faculty is much more malleable. My primary responsibility with faculty is to support each course syllabus and reinforce the expectations set by each instructor. It is important to me that the students build a relationship with their faculty members. I work to build strong partnerships across Grounds, but it is even more important that the students work one-to-one with their instructors to navigate each course. While I do communicate with instructors, it is typically as a secondary resource in complicated situations. Along with their instructors, I also work with deans and faculty advisers, who are always the primary resources for the students. My role working with the students happens on a very micro level. I spend most time working with first- and second-year students. The transition from high school to college is significant, so I try to find a balance of supporting each student’s individual needs, while also allowing them the space to create their own experience. I’m proud that this group of students takes on the responsibility of being self-advocates and individually responsible for their own output. My assistance in the early stages of that process hopefully builds a foundation for growing independence throughout their UVA experience. Q. With all of the time demands on student-athletes – practices, media responsibilities, travel, adequate sleep, nutrition – how do you carve out time for their coursework? A. It is important to find a balance. Along with all of the requirements, it is also important that they are able to enjoy the experience – especially during this time of the year. The most important thing to me is understanding how each student works most productively. Some students work better with less structure than more; some are more comfortable working independently than in groups. I try to meet each student, rather than fitting them all into one box. That makes the time-management process a joint effort, rather than something I pass on to them. The input the students have, while prioritizing the non-negotiables mentioned above, creates a greater sense of buy-in and individual accountability. One of the biggest things we talk about is maximizing the daylight hours. This is a big part of the transition from high school to college for first-year students. Recognizing that there are opportunities for productivity within the pockets of time during the day makes the amount of work each evening more manageable. Q. Do you find that UVA coaches and professors are pretty flexible in reaching accommodations that allow the players to fit everything in? A. Our faculty members are very supportive, with high expectations. Any accommodations that are in place are authorized and created by the instructor. The standard is generally whether an accommodation would be made for any student with extenuating circumstance. Our faculty members respond to student self-advocacy and are often willing to accommodate a schedule with unique time demands for a student who has been engaging throughout the term. The standards of the UVA faculty ensure that we have a great balance between academics and athletics within the student-athlete experience. In my experience, the top priority to our faculty is ensuring that any scheduling accommodation meets the learning experience of every other student in the class. Our coaches are very similar. The priority is always to minimize the impact on our students’ academic requirements as much as possible. 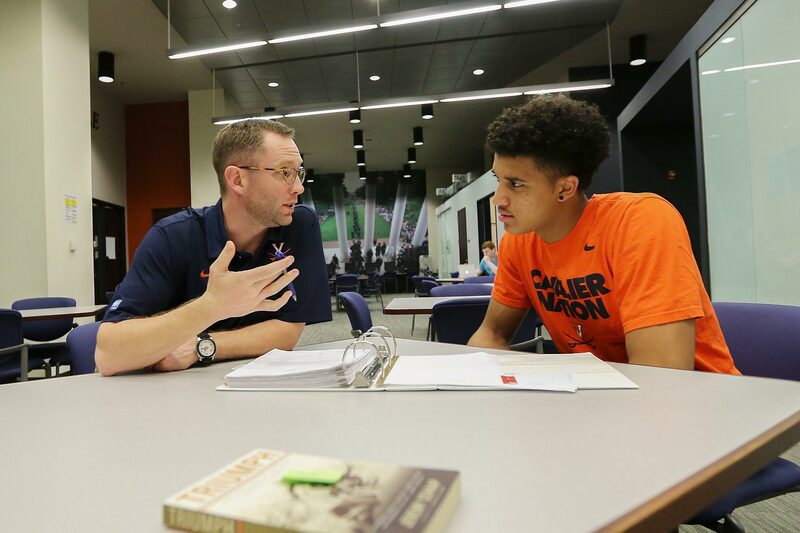 Coach Bennett, Ronnie Wideman and I look at the schedule of required classes each semester and build the practice times around the academic experience as much as possible. Similarly, I work closely with team trainer Ethan Saliba and strength coach Mike Curtis. We collaborate to make sure each student’s academic schedule is a priority when dealing with medical needs and strength training. Inevitably, there will be some challenging logistical conflicts, but the goal is always to find a way to best honor the student’s development. All of those individuals value the academic experience of our students within their role in the program. Q. How do student-athletes apply some of the traits that make them successful in basketball to their academic pursuits? Are there “academic leaders” on the team who hold their teammates accountable for studying, too? A. The personalities of our basketball players on the court are very consistent with who they are in the classroom. To highlight a few: Jack [Salt] is an earnest worker, always willing to do the little things to be successful. Mamadi [Diakite] is an energetic participant, eager to contribute. Ty [Jerome] is tough-minded and tactical; he will always find a way to make sure his work is complete. Similarly, I think the leaders on the floor are the leaders off the floor. We have a unique culture that has been built throughout Coach Bennett’s tenure, and it extends well beyond JPJ. Some of the best academic leaders do so by example. Our students see how hard their peers are working. No one in our group enjoys being the one who isn’t holding up his end of the bargain. This year, Jack set the tone and wasn’t afraid to push his teammates if a standard wasn’t being set. While Jack is the leader of this group, [former players] Isaiah Wilkins and Devon Hall set the standard he learned. Similarly, those two benefitted from the foundation set by Akil Mitchell and Joe Harris. That connectivity is how habit becomes culture. Q. So a player is in a study hall in at Minneapolis hotel ballroom and is stuck on a particularly thorny grammar point in his Advanced Italian homework. How do you get him back on track? A. I am definitely not an expert in all course subjects – very few, as a matter of fact. I do not do much content work with my students, which I’m sure is to their benefit. Rather, I help them navigate their academic paths, manage their time and maximize their resources. Both the students and I rely on the resources across Grounds and within the athletics department to achieve academic success. I help make sure they are utilizing resources like the Writing Center and, most importantly, working one-on-one with their instructors. I often emphasize communication with an instructor to make sure there is clarity on an assignment or reading. It is also critical to plug into the support provided within the athletics department. Our administration has prioritized the student experience to make sure there are tutors and mentors who are skilled in specific subject matter who might be more readily accessible within the student-athlete schedule, in combination with their work with a faculty member. Similarly, we have recently expanded our leadership, service and career development opportunities such that our students can be involved within their student-athlete experience. We have athletics department staff members and programming opportunities specific to those areas of expertise within our Student Athlete Advisory Committee, Student Athlete Mentors and Student Athletes Committed to Honor student groups and partnerships with the Career Center, Madison House and the Honor Committee. In short, I try to be a facilitator. I do my best to make sure my students are plugged into the resources they need in the classroom and opportunities available for their growth. There are incredible people at UVA, and I do my best to make sure I am a connector to people, programs and resources on Grounds. I don’t want to be the only person pouring into the lives of the students I work with. Q. Without naming names, what is your biggest success story as an academic counselor? A. There are two that come to mind, from both our current roster and a past graduate. Both allowed UVA to stretch them beyond their comfort zones and benefitted greatly. One is a student with whom I will forever share a bond because of the hours we spent together. His time at UVA defined him in ways he didn’t expect. No matter the number of highs or lows we shared, I’ll always be proud of how hard he worked and who he has become. I’m sure he taught me more than I ever taught him. The second probably had the biggest developmental growth of any student I have worked with. Coach Bennett has had a number of international students over the years, and their transitions are so unique. Every incoming student has challenges, but international students have another level of adjustment. I’ve been fortunate to work with a number of them, and I am amazed when I think of the growth of this student. Q. Which is more exciting to you, the Final Four or Final Exercises? A. I’ve never thought to compare the two, which is a sign of how significant this moment is for the program. There are a lot of similarities, the more I think about it. Both require an incredible amount of dedication and are the culmination of hard work becoming historic moments in someone’s life. Final Exercises is such a unique tradition for UVA graduates, it is something that likely cannot be understood without truly experiencing it, which is similar to the Final Four. I would probably say that being a participant-observer in the Final Four is just a bit more exciting. While both require so much hard work, there is a level of good fortune required to advance in the tournament to this point. I’ve been in love with March Madness my entire life and to think that some of my students will be on that stage is significant. I have been thrilled to see every student who has completed four years of eligibility with Coach Bennett walk the Lawn, but I have never experienced it for myself. I am a doctoral student in the Curry School, so my perspective on this might change after I have my chance in the coming years.